I've been a busy, busy, busy little bee this week! So much going on, so much to do, rushing here there and everywhere, working incredibly hard preparing for this weekend's Yarndale event. Yesterday was yarn bombing day, we worked our way through the park spreading some colourful, happy, woolly goodness. It was hard work, but joyful also. Our town is looking glorious with the first signs of Autumn tip toeing in, yet it has been warm and dry and pretty perfectly Septemberish. Of course, I haven't yet finished my creative work for Yarndale, I suspect I will be working on it right up until the doors open on Saturday. I still have some of my precious crochet decorations to install in the park, and there is still much to do at the festival venue. ......today we took on the enormous task of hanging it. It looks INCREDIBLE. Words can't describe how it made me feel to see it come together today. I will be taking oooodles of photos of it all and will share much more of the story with you at a later date. We still have a great deal to do tomorrow to get everything ready, but we are all excited and can't wait to see our festival unfold in all it's creative glory. I've been down at my studio tonight, tidying it up and getting it ready to open the doors there too at the weekend. If you are visiting for Yarndale and fancy popping in to the studio to have a peek, you will be very welcome. All the details and opening times can be found on Tracy's sweet blog here. Right.....I need to get back to my crochet decorations, they won't get finished otherwise. 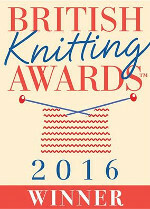 I am very much looking forward to meeting many of you at the weekend, do come and say hello to me in the Knit and Natter Lounge. Lots of love....see you on the other side! I hope you reaped your rewards Lovely Lucy. Can't wait to read on. Missed it all cause I was on some well-needed holidays. So nice to come back to this! Hope Yarndale went well. Looking forward to reading you again when you've recovered. So glad to see you've updated your profile picture. It's BEAUTIFUL! Love love love it!! You all lucky ! How much I would be there with you !!! We are so far ! How can I join you ???? Hugs from an Italian in Spain. We paid a visit to" Yarndale Town" on Saturday, it was an organised trip with not enough time to pop in and say hello; but I did see your yellow ducklings on the swing bridge as we went through on the canal boat. It was lovely to see the places you blog about. You are right it is a beautiful part of the country. Wow! It's all over now. Time to relax, I'd say. The bunting looks wonderful. So much hard work must go into setting up the Yarndale event but from the photos on your blog and others that I read It is certainly worth it. I would really love to come along to the next one! I was so pleased to find one of my donated triangle buntings. Well my daugher's friend found it, she's called Alexa. Well spotted Alexa quite a feat considering there were 5 miles of bunting. I bet you are shattered!!! We came to yarndale on Saturday and it was absolutely fantastic. Loved every minute of it.I have been to woolfest twice and love that too but think Yarndale was much more colourful and fun. great job!! good luck from italy!!! I just want to say we had an amazing time at Yarndale this weekend. I even found my bunting proudly hanging with the others! It looked amazing. I visited the studio and it felt like an outer body experience. I felt like I had stepped into blog land!!! I saw you in the knit and knatter, but didn't get chance to say hello. I loved Yarndale. I will be blogging about it and I am waiting for your next blog update. Everyone did a fab job. THANK YOU. p.s loved the trip on the Yarndale bus!!! My three friends and I had the best day at Yarndale!! Thank you Lucy - for inspiring us, for the brilliant blog and for all your hard work (and to everyone else who was part of Yarndale). It was a huge success - just looking forward to next year now. How Exciting! If I were in the UK I would HAVE to pop in and visit a while. I hope you have a most tremendous time. I have been following Yarndale through the hash tag #yarndale on Instagram...everything looks amazing!! I am amused by the amount of people that are too shy to meet you!! I guess I would be star struck too :-D. Congratulations to an awesome job that you and the team did on Yarndale...wish I could see it in person!! Dearest Lucy. Yarndale today was absolutely fab! Well worth the 5 hour journey and overnight stay. So many Yarnaholics and plenty of fondle-fodder. And it was lovely to meet you. Keep smiling through tomorrow. Love from 'the brooch on the coat' girl.